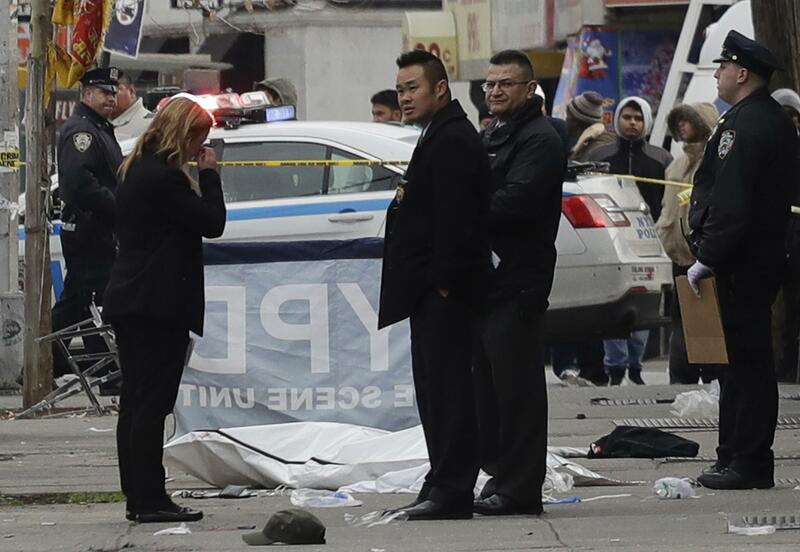 UPDATED: Sun., Dec. 3, 2017, 10:13 a.m.
New York police are looking for a driver who fled after striking several people, killing one and seriously injuring another, on Sunday morning. The driver plowed his car into at least six people about 4:30 a.m. in the Richmond Hill neighborhood in Queens, according to the New York Police Department. Apart from the one person killed immediately and the one in critical condition at a hospital, the other four are in stable condition. Witnesses told CBS New York that a group of people were leaving the bar when they saw one man beating up another on the sidewalk. As several people were trying to stop the fight, a car came rushing down the sidewalk, plowed into the group and kept going. Queens resident Milagros Urbina told CBS New York that she heard some screaming before she saw the car barreling down the sidewalk. Police said two other people were stabbed during the fight and are at the hospital. It’s unclear whether the fight and the hit-and-run were related. Police said that they have no information about what prompted the scuffle but that investigations of the two incidents are ongoing. Police have not released any information about the victims, the driver or the vehicle. Published: Dec. 3, 2017, 9:52 a.m. Updated: Dec. 3, 2017, 10:13 a.m.